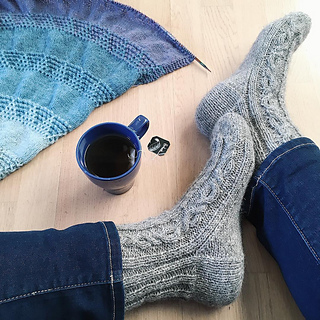 Snorre is a pair of cozy, thick socks featuring a bold cable running down the length of the sock. These socks are perfect for puttering around the home on a Sunday, or for a walk in the forest. The socks are knit with the yarn held double, which makes them a very quick knit. The bold and stricking cable is simple to knit and mirrored on the socks, which makes the finished pair beautifully symmetrical. Notes are given on where to start the toe. 100 (100) 110 (120) 120 (130) g sock yarn held double.